Intrepid Dorset lad Harry Bucknall is a freelance travel writer and author whose 183-day adventure across the Aegean in the summer of 2006 gained worldwide recognition in the form of his book In the Dolphin’s Wake. 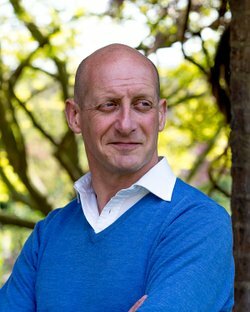 After 12 years service in the Coldstream Guards, including operational tours in Northern Ireland and Bosnia, Harry worked in the oil and mining industry and as a consultant in the Middle East. He has also produced theatre on the London Fringe, sat on the Olivier Awards Panel and acted as reviewer for Arts Council, London and a number of West End publications. Published in 2011, his debut novel recounts his travels from Venice in the West to Istanbul in the East: a journey across the Aegean of over 8,000 kilometres that included the glories of Mount Athos, 36 islands and every island chain in the Greek Archipelago; 57 sea passages on 35 ferries, 4 landing craft, 3 hydrofoils, a fishing caique, a sea plane, 11 buses, 2 trains, an open top Land Rover and a duck egg blue 1961 Morris Oxford. Recounted with humour, pathos and at times drama, the book has proved hugely popular and Harry has appeared on BBC Radio 2’s Good Morning Sunday with Clare Balding, Radio 4’s Saturday Live, Excess Baggage and written variously for, amongst others, The Sunday Telegraph, The Spectator, Sunday Times Travel Magazine, The Scotsman, Irish Independent, Country Life, The Lady and Dorset Life. Harry released his second book Like a Tramp, Like a Pilgrim in 2014, following the story of his 1,411 mile journey from London to Rome in the summer of 2012. An amusing and erudite account of Harry Bucknall’s 183-day journey through the Greek islands from Venice, in the West, to Istanbul, in the East In the summer of 2006, Harry Bucknall traveled from Venice to Istanbul – a journey across the Aegean of more than 5,500 miles that included the glories of Mount Athos, 36 islands, and every island chain in the Greek Archipelago. It also involved 57 sea passages on 35 ferries, four landing craft, three hydrofoils, a fishing caique, a sea plane, 11 buses, two trains, an open-top Land Rover, and a duck egg blue 1961 Morris Oxford. 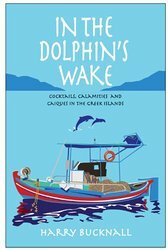 Recounted with humor, pathos, and at times drama, this is not only a journey through the Greek islands but also a journey through Greek history, mythology, custom, and folklore -a Greek island companion loaded with adventure, mishap, and laughter offering a contemporary image of Aegean life today. Watching in disbelief as his computer was struck by lightning in 2007, Harry Bucknall had no idea that the subsequent trail of events would lead him to Rome – five years later, on foot. 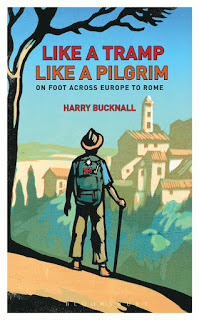 Following the Via Francigena, the ancient pilgrim path that dates back nearly two thousand years, Harry walks through England,France, Switzerland and Italy weaving a historical tapestry liberally coloured with tales of angels and saints, emperors and kings and war and revolution. He uncovers a little known route that leads him through vineyards and villages, towns and cities and over rivers and mountains to the heart of the Eternal City, Saint Peter’s Basilica. adventure and mishap follows Harry as he encounters the changing faces of a landscape suffused with history; yet his journey is perhaps most enriched by the extraordinary stories of those he meets – fellow pilgrims and locals alike – along the way.